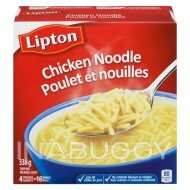 Lipton's Chicken Noodle Soup Mix (114g) brings families together with oodles of noodles and fun, made with REAL chicken broth and enriched flavorful noodles. Our newly revised and loved recipe is a tried and true combination of delicious home-style flavours, with low fat and 25% less salt than our original recipe. No artificial colours, flavours, or preservatives in this soup mix make it a healthy option as a base for any hearty homemade soup recipe or as a perfectly satisfying chicken soup dish of its own. 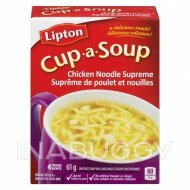 Warm, soothing, and satisfying since 1940, Lipton soups are made with REAL chicken broth and enriched flavorful noodles, and are a great way to please the entire family! Try all four flavors of our Lipton Soup Secrets Soup Mix, available in classic Noodle Soup Mix with Real Chicken Broth, Extra Noodle Soup Mix with Real Chicken Broth, Ring O Noodle Soup Mix with Real Chicken Broth, and our Chicken Noodle Soup Mix with Diced White Chicken Meat - each space-saving box of delicious Lipton Soup Secrets Soup Mix makes 6-8 servings. Enjoy it as a satisfying anytime snack for as few as 70 calories (or less) per one cup serving. 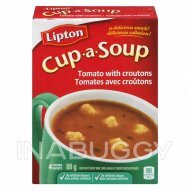 Visit www.LiptonKitchens.com for more recipes and inspiration.